I forgot to tell y’all about my birthday spanking! It was lovely. Yummmm…I’ll have to make it quick though. I’m on the run today! My entire birthday was wonderful and a perfect lead in for my spanking. We went out for a relaxing dinner so I could have my favorite meal and then went home for dessert and wine. It was all wonderful so I was in the best mood when we finally moved into our bedroom and got down to business. Dan gave me a nice warmup with his hand, doing his usual thorough job of spanking my entire bottom. 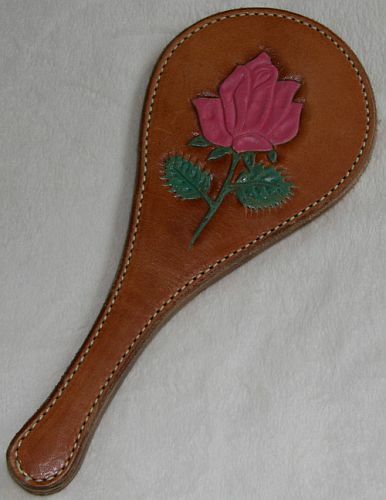 Then, as promised, he brought out my favorite rose paddle. While Dan spanked, I counted the spanks. It was perfect. He spanked slowly and rubbed my bottom every few spanks which made the experience oh so sensual and he sent me right into spanko heaven. I know I’m late to the party, but Happy Belated Birthday! For a birthday present, I’m tagging you for a meme. Glad you enjoyed your spanking!!! SA, thanks! I’m sorry I didn’t see this sooner (I was away for a bit) so I missed the tag. Whoops!